This app helps players to choose numbers with an algorithm, UNIQUE IN THE WORLD for Canada 6/49 Lottery draws. Generating two-dimensional and Even/Odd Canada 649 winning numbers. 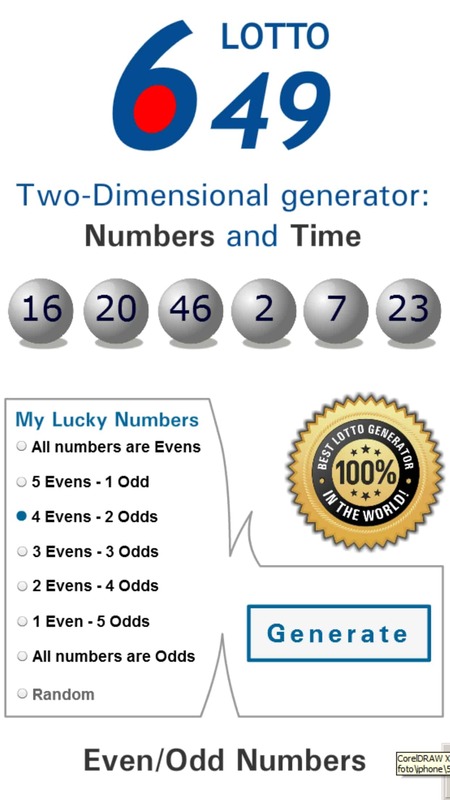 First of all, this two-dimensional app generating numbers contains an algorithm, UNIQUE IN THE WORLD that acts like real lottery draws. As in reality, every number is chosen in a certain time. This is how it happens with the app and it generates the time as well as the numbers, being the closest simulation to the real lottery draw. Also, you can choose how many even and odd numbers to generate and play. The Canada Lotto 649 is everyone’s favourite national lottery, known for its record jackpots and easy-to-play format. The lotto reveals the rules of the game in its name: guess 6 out of 49 numbers to win the jackpot! In a typical 6/49 game, six numbers are drawn from a range of 49 and if the six numbers on a ticket match the numbers drawn, the ticket holder is a jackpot winner – this is true no matter in which order the numbers appear. The probability of this happening is 1 in 13,983,816. Lotto 6/49 is one of two national lottery games in Canada. Launched on June 12, 1982, Lotto 6/49 was the first nationwide Canadian lottery game to allow players to choose their own numbers. Previous national games, such as the Olympic Lottery, Loto Canada and Superloto used pre-printed numbers on tickets. Lotto 6/49 led to the gradual phase-out of that type of lottery game in Canada. Winning numbers are drawn by the Interprovincial Lottery Corporation every Wednesday and Saturday, executed with a Ryo-Catteau Tulipe ball machine. The probabilities associated with Lotto 6/49 are determined by calculations based on equally likely outcomes but their interpretation is empirical, as follows. If an experiment (such as a weekly Lotto drawing) is repeated under similar conditions many times (mathematically the requisite number of times must approach infinity) then the probability of an event is the long run proportion of experimental repetitions on which the event occurs (therefore is called a law of large numbers and it is a mathematical result only). In conclusion, the probability of obtaining a fourth place prize is 0.0009686. So, this means that in 26,000 Lotto draws, each particular choice of six numbers will yield a fourth place prize (matching exactly 4 numbers) on approximately 0.0009686 of those plays, that is 26000 x 0.000986 = 25 times. There is no guarantee that this will happen 25 times. The actual number of times is random and subject to what is called the Poisson approximation. Therefore, the figure of 25 represents an expected number of winnings and is a useful measure by which to compare the performance of different strategies. Odd numbers are those which end in 1, 3, 5, 7 and 9 while even numbers are those which end in 0, 2, 4, 6 and 8. You are more likely to win if your odd-even number combination is either 2-4, 3-3 or 4-2. More than 70% of the winning combinations in Canada lottery 6 from 49 in the past two years are in these category. This application has no link in no way with Canada Lotto organism and it does not allow to participate in the official game of Canada Lotto.